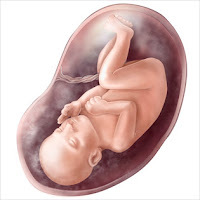 The third trimester of pregnancy starts at week 28 to week 42. This stage seems quite difficult for me especially now that I’m on my 33rd week. I felt the sudden bloat of my tummy and any other changes that’s bothering me through out the day. At this point, I can feel that my baby’s movement is stronger than the usual. There are times that when she kicks or maybe switches position, she puts pressure on my bladder that makes me rush to the bathroom immediately. My baby bump is getting bigger and heavier especially after eating. Sometimes I’m still in shock seeing my self in the mirror. This is the biggest I have so far! I can’t even reach my toes. I have to bear with backaches everyday and my feet or lower legs are getting tired often. Hunger is the worst feeling in the world. I get hungry every 2 hours and if I don’t munch on something, my baby gives me jabs and kicks. I like it when I drink coffee in the morning because she goes high and wild inside as if she’s dancing or giggling. Weight gained is normal because the baby grows almost double in size. Maybe in 2 weeks or so I would weigh 50 kilos or more! I gained an approximately 10 to 12 kilos from my original weight. Sleeping is not really a problem for me. It’s true that there is always a discomfort in sleeping position because of the bigger tummy but I already trained myself lying on my left side so it’s not giving me difficulties. Being tired all day makes me fall asleep fast. Overall, despite of the uneasiness, the final trimester is a great time in my pregnancy. It’s the time when I totally feel that I am pregnant, the time when motherhood emotion starts to come out and the time when we can strongly feel our bond to our baby. We have made it through the trials and challenges of the first and second trimester. More weeks to go and we continue to hope and pray that everything will be alright for baby and me. For now, I have to enjoy the experience of being pregnant while waiting for the day that I will become a mother.